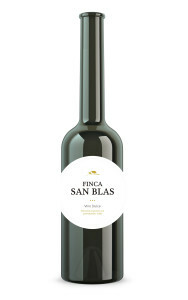 Finca San Blas project has a very close connection with Nature and a very special relationship with wine. In their vast estate of 585 hectares in Requena, mostly lush forests, they grow a wide variety of grapes vines, such as Bobal, Tempranillo, Cabernet Sauvignon, Merlot, Syrah, Chardonnay, Merseguera, Xarello and Chenin Blanc, selecting only the best grapes in search of terroir wines with character but extremely elegant. The domain: a unique natural area located 2 km Southwest of Requena (about 80 km West of Valencia in the highlands) where the team grows olives, almonds, cereals and vines along with the local flora composed of pines, junipers, aromatics herbs such as rosemary and saffron. The result is a land that is impregnated with all kind of flavors and that gratefully conveys its personality and character into the wines. Once we climb to the highest point of Finca San Blas, the show is unsurpassed. Our eyes are recreated before a colorful kaleidoscope: different tones and shades of green, brown, yellow and ochre which make up this amazing puzzle. The vineyards: with an average altitude of 700 m above sea level, the vine is the major crop on the domain with 83 ha. It grows in its valleys and its gentle slopes, surrounded by this nature that protects it from the typical strong winds of the mountain climates. The climate of Utiel-Requena is Mediterranean with continental features, with long and cold winters and dry, warm and short summers, as well as a marked thermal amplitude between day and night (sometimes up to 30 ° C), very conducive to a slow and proper maturation of the grapes. These weather conditions also protect the vine from diseases, this being less prone to attacks of plagues. The trellis system to 2800-3500 vines per hectare favors a high leaf surface, which decisively determines the optimal ripening of the grapes. The winery: as in the most traditional style of the classic French château moved to our culture, the winery is located in the center of the estate. That way, craft character of the wines is preserved and wine making becomes something natural, organic, as the winery is the core that harmonizes and balances: after the manual harvest in small crates of 10 kg, grapes are meticulously chosen at the selection table before falling into the vats by natural gravity. The natural slope of the winery removes the need for unnecessary and harmful use of pumps. The winemaker: there is a strong link, beyond the professional one, between the winemaker and the winery. Nicolas Sanchez, a specialist of the Bobal grape variety, is Professor of Viticulture at the School of Viticulture and Enology of Requena and the Polytechnic University of Valencia. He has set challenges and innovated where no cellar had dared before, planting new varieties unknown in the area, implementing processing methods ever used in the region (such as not submerging the cap) or importing the techniques of Tokaj for their latest creation, a sweet botrytized white wine. The wines: terroir wines with a strong character but yet extremely silky and elegant, which are the result of their environment, being heir to a unique natural wealth, which expresses the personality of an estate that is much more than vineyards. Aging: 3 months in new French oak (500 liters, light toast). The blend is formed by a portion of solera wine. Fully aromatic, complex and tasty.